I finished off last years sweet potatoes the other day. There wasn’t much left, just a few small oddly shaped ones. There was enough to try this dish though and it didn’t disappoint. The leftovers were also excellent for lunch the next day, cold right out of the fridge. I had everything to make this except the goat cheese. I didn’t want to run to the store. I don’t have a grocery right down the street anymore. Sigh. No more running in for milk and bread. Be back in five? Not so much. But the sunsets out here are well worth the trade of not having that luxury anymore. So back to the story, I used queso fresco instead. Like I said, it turned out great. But I would like to try it someday with the goat cheese. This is from Recipes from the Root Cellar by Andrea Chesman. 2. Heat the oil in a large ovenproof nonstick or cast-iron skillet over medium-high heat. Add the sweet potatoes, onion, and garlic, and saute until the vegetables are tender, 6 to 7 minutes. Taste to make sure the sweet potatoes are fully cooked. If needed, saute for a few minutes longer. 3. Meanwhile, beat the eggs with the milk. Stir in the sage, salt, and pepper. 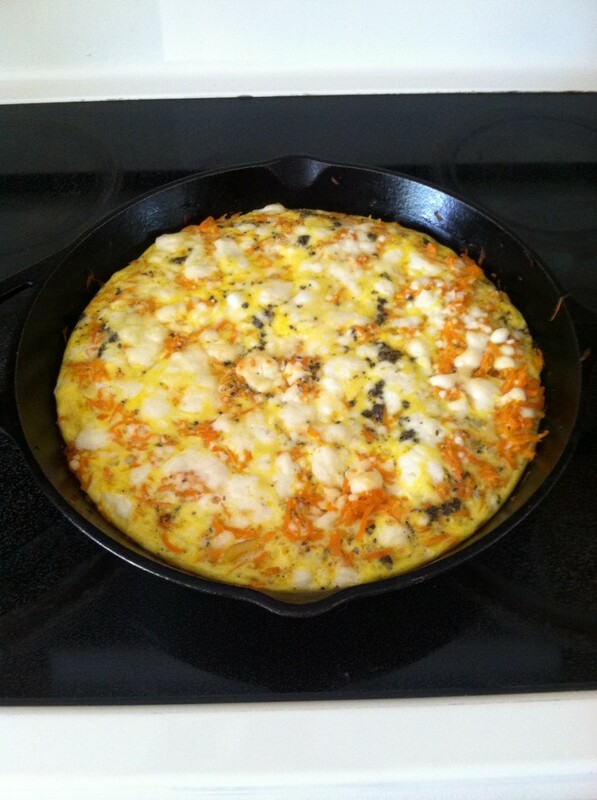 Pour the eggs into the skillet over the cooked vegetables and cook for 1 minute. Then, using a spatula, raise the cooked egg off the bottom of the pan, allowing any still-liquid egg to run onto the bottom of the skillet. 4. When the eggs are set, sprinkle the top with the cheese and transfer to the oven. Bake for 10 to 15 minutes, until the top is browned. 5. Let stand for at least 5 minutes. Cut into wedges and serve hot or at room temperature.